On September 13, 1995, this episode of Robb’s Life aired on WHBF-TV. Robb had been very sick the week before, and he and his parents, Lorney and Hattie Dussliere, realized they needed to select a headstone for their grave and check that item off the to-do list. 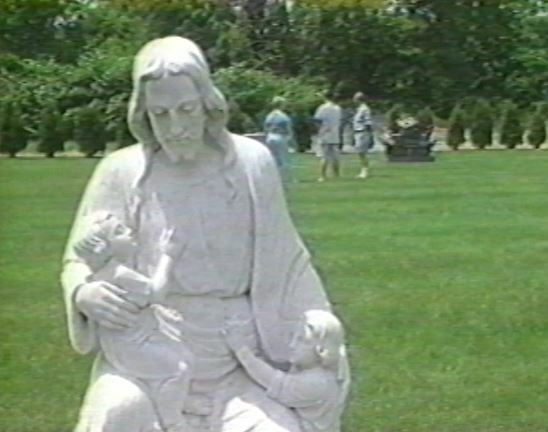 Robb barely smiled during this video shoot at Moline Monument, although you can hear him laugh during his first comment about the three of them agreeing “quickly for a change.” It was obvious he was not feeling well. Help keep Robb’s legacy alive! Donate to the DeLaCerda House and help provide shelter and support for homeless HIV and AIDS clients. Go to www.delacerdahouseinc.org and click on the “Donate” button on the right side of the page. The first time I had a chance to talk very much with Robb’s parents was the day he went with them to select a grave site at St. Mary’s in East Moline. This is one of my favorite pieces in the series. The tone and structure of the stories began coming together in this one. Real life is made up of serious moments that are sometimes punctuated with humor, and humor can quickly give way to sadness. Robb was a very funny, mischevious guy, but just below the surface, the people around him are beginning to feel the heartbreak of what is coming in the not-so-distant future. I felt that this story brought these different emotions together, and it became a template for the stories to come. Also, by the time we shot this story, near the end of May, 1995, Robb and I were more at ease around each other. I had met Lorney (Lawrence) and Hattie Dussliere a few weeks earlier at Robb’s house, but we didn’t talk much that day. Now, as we toured the cemetery, I had a chance to interview them for the first time. They are wonderful people. Please donate to the DeLaCerda House and keep Robb’s mission alive, helping HIV and AIDS patients who find themselves homeless. Follow this link and click on the Donate button on the right side of the page.